I expanded my pamphlet collection mightily this week! Here are the first two of the items I acquired. First up, from 1931 and the Kraft-Phenix Cheese Corporation, “Cheese and Ways to Serve it.” The covers feature perky apron-wearing housewives – I’m pretty sure that each of them is different. I was startled to learn from the interior advertisements that Velveeta (“The Delicious New Cheese Food”) dates all the way back to 1931, as does Philadelphia Cream Cheese. The booklet is sized – and has perforated pages – so that the recipes can be pulled out and added to a recipe box (I don’t think my copy is missing any). There’s a short introduction from Marye Dahnke, Director of the company’s Home Economics Department. 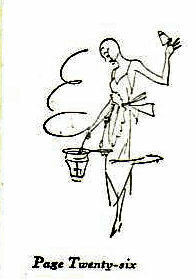 There are also charming little line drawings on many of the pages – not all as odd as this one, with its evening-gown-clad cook at work – and color illustrations of food. Here’s one of the booklet’s suggested luncheon menus: Eggplant Souffle (a misnomer, it’s more of a casserole), Rolls and Butter, Tomato and Cucumber Salad (with Kraft Kitchen Fresh French Dressing), Cookies, and Coffee. 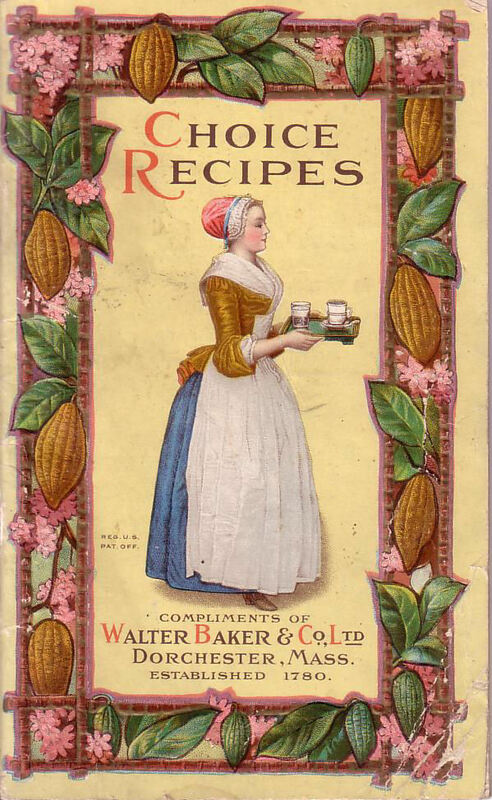 Next, “Choice Recipes,” 1916, from Walter Baker & Co. Ltd., with a nice partly embossed cover. The inside title pages says “Chocolate and Cocoa Recipes by Miss Parloa, Home Made Candy recipes by Mrs. Janet McKenzie Hill,” but I actually counted seven major contributors to this booklet, including Fannie Merritt Farmer, and there were several recipes attributed to single individuals as well. Mix half a pound of cocoa and three cupfuls of sugar; cook with two cupfuls of boiling water until smooth; add to three quarts and a half of milk scalded with cinnamon bark; cook for ten minutes. Beat in the beaten whites of two eggs mixed with a cupful of sugar and a pint of whipped cream. Cool, flavor with vanilla extract, and freeze. Serve in cups. Garnish with whipped cream. – Janet McKenzie Hill – Ladies’ Home Journal. Recipes like this make me really sorry I’m lactose-intolerant! Pingback: Brimfield Haul Part 4: Aunt Sammy and more chocolate | History Live!